The wing has been mounted. I finally purchased a cutting mat with grid lines. It really helped me line up the tail with the wing to make sure they are parallel. One hint that I can give is to use a spot of hot glue at the leading edge of the wing to the carbon spar. When that sets you can make minor changes to the rear and set it again with a small dab of hot glue at the trailing edge. When you are happy with everything CA the wing in place. I installed HXT 5 gram servos and attached the ailerons and elevator. The instructions said to use scotch tape for hinging, I did but only had matte finish available. I am not to concerned about the looks but am a bit concerned with the strength. It does not seem to be adhering really well to the painted balsa. Time will tell! 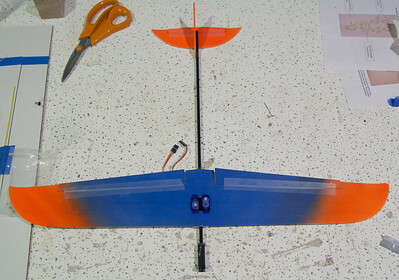 The leading edge of the wing is 3.25″ back from the end bell of the motor. This suggestion comes form Hance on rcgroups.com and his suggested power system. The CG can be adjusted by moving the battery back and forth. I think this plane will be ready to fly with a few more nights of work! Looking good! The orange tips are sharp.